This is the second day of a five day winter intensive with Joerg Hassmann. We take a cushion and lying on the floor with a cushion underneath us, we rock back and forth with our pelvis as a pivot point (fulcrum). The movement is back and forth in our pelvis and not rolling side to side. “Rocking is pushing and falling” says Joerg. We dispense with the cushion and ‘slush’ our pelvis on the ground. Our shoulders, upper body and shoulders remain on the ground and our pelvis and legs move freely. We throw our legs back and forth while keeping contact with the floor. Our pelvis rolls side to side – freely, and our legs follow. We move from our back, and lie on our side – balancing there. We remain stationary, and rearrange our body so that we fall – but not far! We fall from our side and onto our back, and then we repeat. Now, we fall onto our front from balancing on our side. It’s a simple manoeuvre and there is the contact with floor on our side. Balancing on our hips to introduce instability and a place to fall from. We use the cushion to add a little height to our balancing on our side, and then repeat the falling described above. We also try hooping onto the cushion from the floor. We elevate our pelvis, throwing it and using the floor contact in our upper body to assist in ‘throwing’ it. We repeat the balancing on our side when on the floor but now with balancing on a partner who is sandwiched between us the the floor. We are on top! The floor is uniform but with a partner we must fit into the landscape of our partner’s body below us. We are arranged head to tail. We have a break and then feedback our experience to the rest of group sharing our findings. 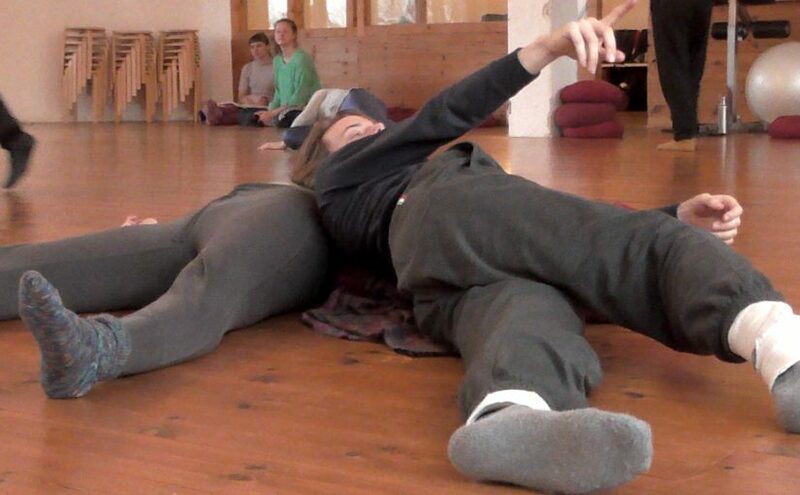 Contact Improvisation is a research – as is said so many times, Georg demonstrates a way of moving over our partner when we are both lying on the floor in the same orientation (head to head, feet to feet). The under-leg of the overdancer is hooked over the other dancer as they roll and hence they become the under-dancer as their partner passes over them. Ineffect, there is a spiralling over them as they travel down their partner and indeed over them as their body is pulled into the mechanism. It’s as if the under dancer is an Archimedes screw. We work in quartets – four dancers. One couple dance in a duet, and the other two observe. Then we swap the observation and dancing roles. The observing couple feedback to the dancers and there is a discussion in the quartet. In my duet, we dance and at some point I hang off their shoulder and fall off. I land on my head which makes a load thwack noise. It scares my partner who exclaims ‘Oh my god! Are you hurt?’ Possibly my head rolled allowing a collapse on to my neck and shoulder. Strangely, I’m not hurt and we are able to restart dancing. I find that in our dance, we are looking for different things. I want more improvisation and less contact, and he wants the opposite with the opportunity to repeat the mornings exercises. Perhaps in contact improvisation there is a spectrum from contact to improvisation – with more of one and less of the other, and vice-versa. After lunch, we have a jam. We start by standing on the edges of the room thus forming a square shape. We stand in silence and after about 5 minutes we are to enter the space. When we hear a ‘pling’ (a xylophone key being struck) then we return to the edges and continue again. It’s a very simple score.